A senior UAE minister Tuesday indicated that the diplomatic rift between Qatar and its neighbors including the UAE, Saudi Arabia, Bahrain and Egypt is likely to drag on in the New Year despite calls for an end. “In my estimation, the boycott of Qatar will continue in 2019 because it’s linked to necessary changes in Doha’s destructive tendencies,” Anwar Gargash, the UAE’s minister of state for foreign affairssaid in a Twitter post. The Saudi-led group and Qatar have fallen out since June 2018 after the four accused the tiny Gulf country of supporting terrorism and becoming too cozy with regional rival Iran. The boycotting countries also imposed a sea/air/ground blockade. Qatar has denied the charges of supporting terrorism arguing that it is victim of a smear campaign. The crisis has dragged on despite mediation efforts by Kuwait, Oman and several western countries including the U.S. which is a key ally of the feuding sides. 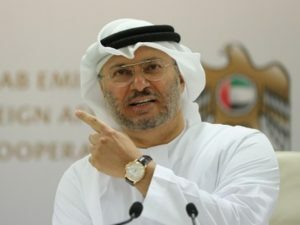 Unlike Gargash, Aref al-Awani, tournament director for the upcoming Asian Football Confederation’s (AFC) Asian Cup in the UAE floated the idea that the UAE could step in and help Qatar host some matches of the 2022 World should the world largest liquefied gas exporter should the world football governing body FIFA expand the number of teams at the 2022 competition from 32 to 48. FIFA is studying the proposal which if adopted at the Qatar tournament could go beyond the capacity of the first Arab country to host the world largest football event. Qatar will need to 4 more stadiums should the tournament is expanded to 48 teams. “If FIFA were to propose it, we would certainly look at the economic impact and media opportunities,” Awani said. “It’s good to have football in the region… sports for us is to bring everybody together,” he added. Posted by KanelkaTagba on Jan 2 2019. Filed under Gulf News, Headlines. You can follow any responses to this entry through the RSS 2.0. Both comments and pings are currently closed.